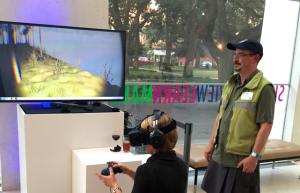 FSU Art Faculty Keith Roberson reports back on the PULSE tech+art festival in Savannah, GA where his VR artworks were shown in two locations. His work, Anomaly in Apalachicola, was well-received at the Telfair Museum’s Jepson Center, and was shown along side other works by Canadian design group Globacore, Video Sculptor Katja Loher, multimedia artist Miwa Matreyek, among others. Keith helped co-curate the exhibit, “Gesture to Exit”, and included many artworks from FSU Digital artists and friends, including Kevin Curry, Patrick Durgin, Adrian Errico, Phil Gleason, Holly Hanessian, Terri Lindbloom, Mandem, Owen Mundy, and UF Faculty Jack Stenner.